In route to Reutte we discovered that Colleen had yet another trick up her sleeve. 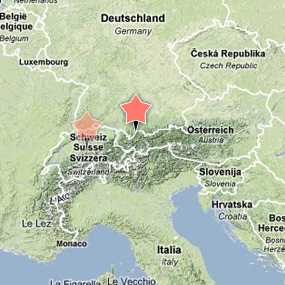 We would be taking a small detour, to Germany! What an awesome surprise. We were able to take a break from life on the road and add another country to our travel resume. 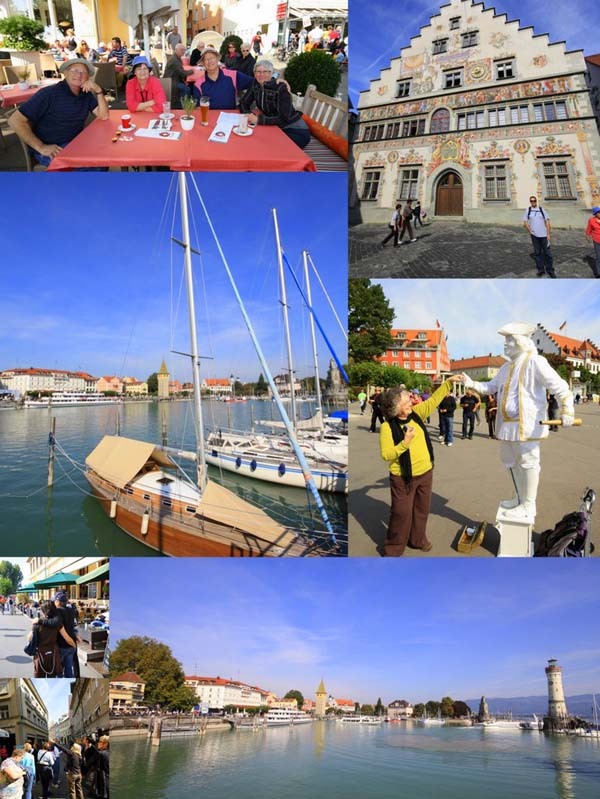 We spent the afternoon exploring Lindau and taking in everything we could in a few short hours. With only a few hours in Germany we decided to head to the top of the town. 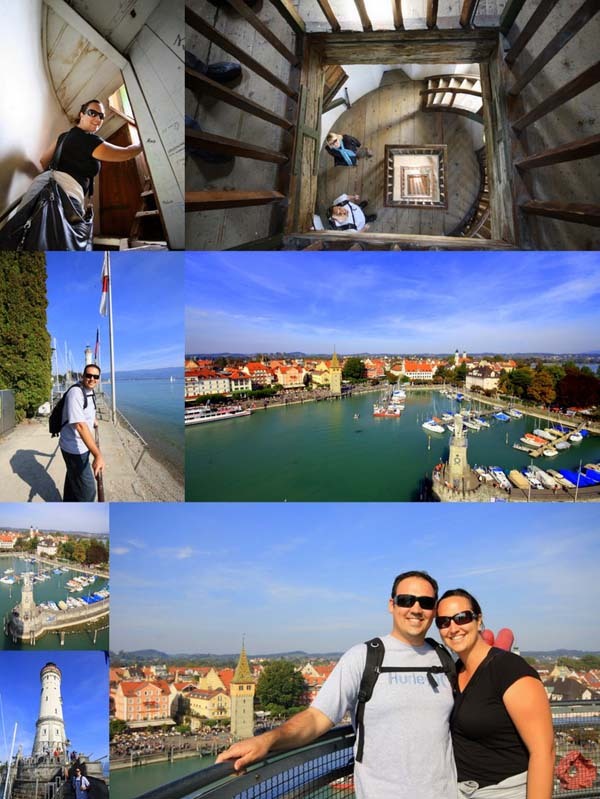 We climbed the lighthouse to catch an aerial view of Lindau. It was a tight squeeze getting to the top, but was well worth it. When we bumped into Colleen at the top we knew that we had picked the best way to spend our afternoon. After a few amazing photo opportunities we (carefully) headed back down the creaky wooden stairs and said goodbye to little Lindau. Mad King Ludwig? We Think Not. Our big day in Austria lead us to Mad King Ludwig’s castle, the very castle that inspired Walt Disney himself! Neuschwanstein is pretty spectacular. The castle is gigantic, breathtaking and serene. But what is even more spectacular is how quickly it was constructed and at such a costly price. 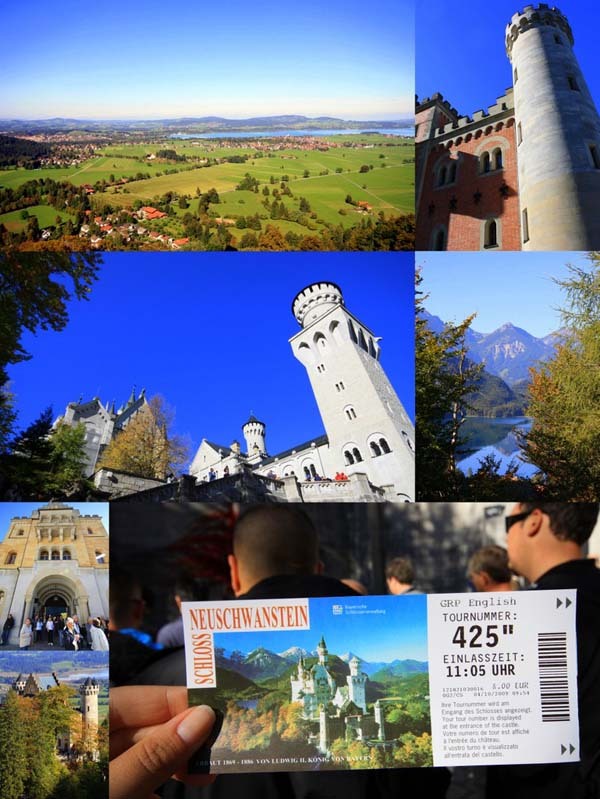 Before we got the up close and personal tour of the castle the group had time to take a quick hike to Marienbrucke Bridge for and amazing peek at Neuschwanstein and the valley below. After we returned from our day at Neuschwanstein we took some time to just stroll around the village near our hotel. Everything there was so quaint. After our walk we had a wonderful dinner with our group followed by an evening of drinks at the bar. 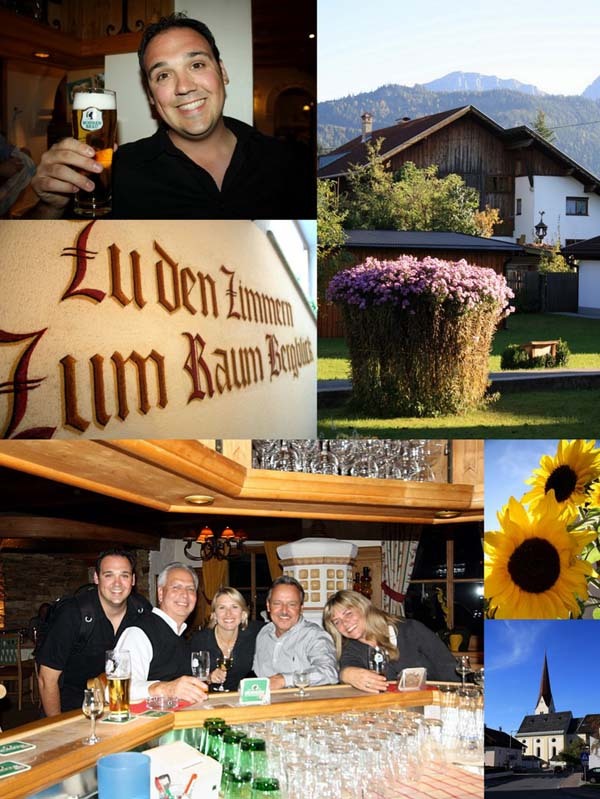 Despite us being unable to convince Ben, our bus driver, to take us to Oktoberfest up in Munich for the night, we still managed to have an excellent time! 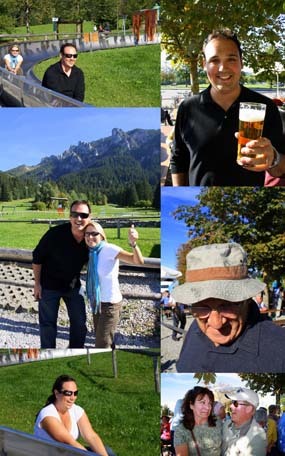 Below: Kevin enjoying a beer, a few shots taken while walking around Reutte, Kevin, Paul, Colleen, Daryl, and Susan at the bar in our hotel. While our group leisurely strolled through Newschwanstein castle without a care in the world Colleen and Ben were making a mad dash to treat us once again. When it came time to meet at the bus we found our fearless leader with sandwiches, chocolate, fruit and WINE! What a surprise! 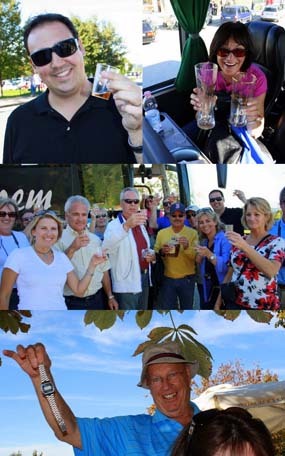 We collected our treats and headed to a lakefront picnic area that was like no other. 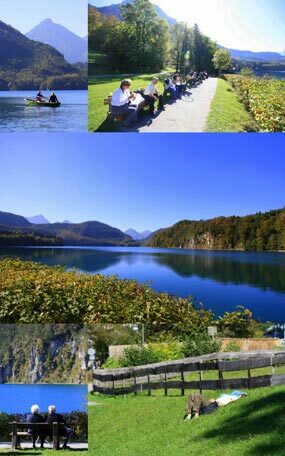 Above: Mike rowing Rita around the lake, our group enjoying lunch, Alpsee lake, a couple enjoying the view, a rare view: Colleen resting! 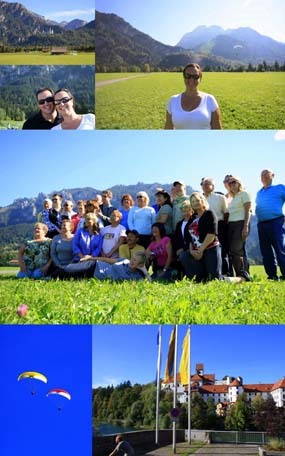 Above: Us and the group during a quick photo stop with the castle in the background, hang gliders, castle views from the bus. After a day sight seeing and picnicking the entire group was excited to hop on the luge. Here is our first person account! What a blast! We knew the luge was in our future. We had been looking forward to this event for months now and it didn’t disappoint! 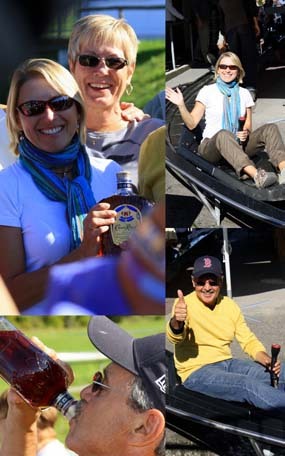 With a shot of Crown from the Canadians, 2 tickets and some words of advice from Colleen we were ready to get our luge on!